I was just reading an article that talked about chopping and modding bikes and the author said they look for old bikes made of steel because the can cut them up and weld them back together easily. 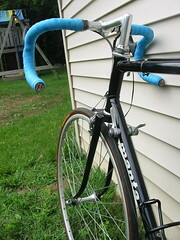 My husband has an older Gary Fischer steel bike frame that he dearly loves to mod. He blogs about it (with photos) over at his place, if you'd like to take a look. Lux, thanks for the link, and great to hear Scott is back on the road again after a 6 year hiatus! I totally agree with you on just the feel of going out and free-riding. Since moving to Charlotte, I too have found a good dea of joy in riding my "walmart bike" and just getting out in some regualr clothes and just letting life roll. I'll admit though, my dad's old steel road bikes and I never got along well though. I used to kill the tires in those once a week easy (35-40miles of riding a week then).